"We supply everything but the guests.” Rain or shine Event Essentials has your special day covered. Their talented and experienced design team and rental staff will walk you through the rental experience to bring all your wedding visions to life. 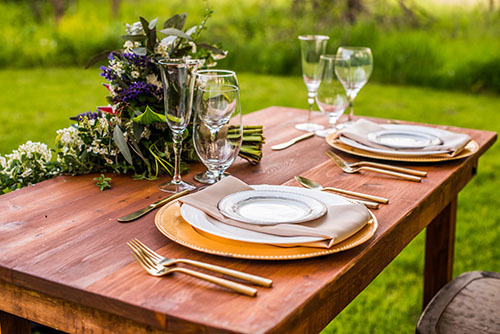 Peruse the website to view the vast assortment of tents, tables, seating, linens, tableware, and décor items. Call Event Essentials now to start the planning process and create a day your guests will love. © 2019. Wedding Planner & Guide, JOY Publications, LLC. Terms. Privacy.